Jim Young, Club President, called to order the Relatively Rambunctious, Rarely Reclusive, Reasonably Respectful, Remarkably Resolute, and Radically Generous Richmond Rotary Club, after which Jan Brown led the Pledge of Allegiance. Stoney Stonework asked for a moment of silence for “freedom, peace, and justice on earth”, and Henry Kelman let us know that the stock market is up and that the 49ers are going to the Superbowl! Josh Surowitz introduced Karine Schomer, and Rafael Madrigal introduced Lesa McIntosh, both of whom have visited on past occasions. Welcome! John Wilson self-reported on his status informing everyone that he’s doing well after finishing up the last of his chemotherapy treatments. Let’s all pray that John’s leukemia has been vanquished and is gone for good. Josh Surowitz made a Membership Committee report. The committee will be hosting a year-long membership contest in which the club’s current members will be divided up into four teams. Each team will be led by a captain who is currently on the committee, Connie Tritt, Stoney Stonework, Alan Blavins, or Josh himself. At the end of the year, the team with the most new members will get to organize a party paid for by the club. Members of the other three teams will be able to attend of course, but will have to pay a steep price for the privilege! Erle bade us remember the Crab Feed on February 2nd. He has 115 in confirmed attendance but is happy to accept additional diners. Also, if you haven’t paid yet, please do. The Building Together project, previously known as “Christmas in April” will start at the end of winter or beginning of spring. Mike Winter is in charge of the project and we’ll be hearing more about this in the near future. The RotoCare Clinic grand opening is February 21st. Please attend if at all possible. The Interact Club will provide the first round of food services for clients when the clinic opens. Jim reminded everyone that Club Assembly is February 22nd. We will be discussing project opportunities for the coming year including the “Every 15 Minutes” program and other worthy causes we might support. Jim encouraged everyone to bring a guest to every meeting and to try to recruit at least one new member for the year. Lastly, Jim reminded everyone of “Every Rotarian, Every Year” and our goal to have every club member donate a minimum of $100 annually to the Paul Harris fund. We still have outstanding members who have not yet donated this year – let’s get with it gang! John Nicol’s 90th birthday is today. He was enthusiastically serenaded by the club via Don Lau’s phone. Happy Birthday John! And last Saturday a group of Rotarian pals visited Jon at home and presented him with a birthday cake that was bigger than he was (at least judging by the photo). It was also George Egan’s birthday two days ago. George made a donation to the Polio Plus fund in celebration. 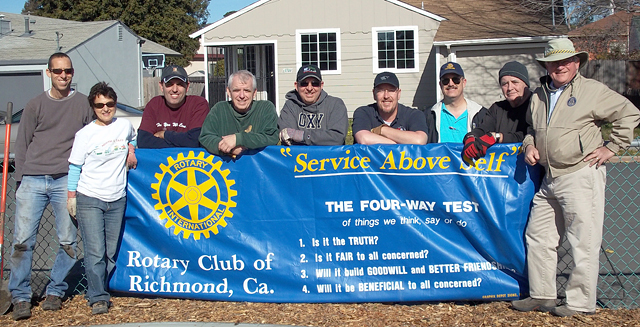 And let’s recognize those hearty Richmond Rotarians who showed up at the Solano Play Lot last week to help plant trees. They included Henry Moe, Tom Waller, Josh Genser, Felix Hunziker, Alan Baer, Alan Blavins, and Jim Young. Nice work, everyone! Jan Brown had happy dollars first, because her mother who had a serious fall has made great improvements, and second, because Jan is going to be a grandmother very soon! Rafael had happy dollars in honor of John Nicol’s 90th birthday. Don Lau had happy dollars because he spent a wonderful week with his one-year-old grandson in southern California, and because he’ll be heading to Hawaii to check on his parents this coming week. Alan Baer had happy dollars for the successful tree planting event at the Solano Playlot on the 19th. Alan reported that they even struck water at one point – oil would have been better, but you can’t have everything. Hank Covell had happy dollars for the $44,000 Salesian High School made at its most recent crab feed. 487 people participated – way to go Salesian! Herb Cole had happy dollars for the Banker’s Lunch he participated in with Jim Young. He learned a lot, had a great time, and enjoyed some great food. Stoney suggested we fine Herb $20 for the length of his report on the Bankers’ Lunch. Other than that he had happy dollars in honor of his grandson who turned 20 years old on Wednesday. John Wilson had happy dollars because Charlie Wong is doing so well. Joe Bagley had happy dollars for the 49ers being in the Superbowl, for being a Rotarian, and for having John back with us. My goodness, everyone seems happy today! Jim reminded everyone that we will be co-sponsoring a Four Way Speech Contest along with the El Cerrito and El Sobrante clubs that will take place at a number of local high schools and will include the Interact Club. Jim put us all to the test today by asking who could name the four “tests” of the Four Way Test. Just to keep us all in good form, they are as follows. Will be it be beneficial to all concerned? Important values by which to live. Once inside the homeowner asked the young man if he would like a cup of coffee, and the young man accepted. Connie Tritt, Treasurer of the Richmond Art Center (RAC), introduced Ric Ambrose, the Center’s new executive director. Ric brings not only an artist’s sensibility to the job, but a business background as well. 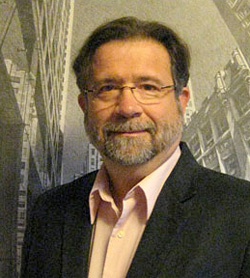 Ric spent 25 years in the museum world as a curator, fundraiser, and arts administrator, and has substantial experience in working closely with communities. A major goal of the Center is to create and offer a unique brand of arts education that includes teaching students not only about making art, but about the arts from a professional perspective, including how to exhibit. The Center attempts to empower and transform both individuals and the community through creative exploration, experience, and education. Ric noted that the Center’s studio facilities are some of the best in the East Bay. It has a faculty of over fifty who teach a broad range of classes, and established artists are often invited to do workshops as well as exhibit their works. The Center’s exhibition program allows for up to sixteen exhibits in the facility’s four galleries. In February the “Art of Living Black”, an exhibit showcasing the work of African Americans will be on display. The Center got its start in 1936 spearheaded by Hazel Salmi. Hazel, under the WPA’s travelling exhibits program, had travelled throughout the country introducing art to communities. She travelled around with a suitcase filled with art supplies and with which she taught members of the communities she visited. When Hazel settled back down in Richmond she wanted to create a place where the community could find artistic inspiration. Based on her vision and the principles she set forth, the Richmond Art Center was established at its first home on the second floor of a building at the corner of 9th St. and MacDonald. After the end of World War II, the Civic Center Plaza was under development and the incorporation of an art education and exhibition space was envisioned for the site. In 1951, the Center moved to its current home in the Civic Center Plaza where it became and remains a dynamic environment for young, emerging artists. Ric noted that the Richmond Art Center is different from other art organizations because it focuses on launching careers by providing the space and support for young artists to exhibit before they’re well known. As a result, the Center receives calls from around the nation and the world inquiring about artists’ backgrounds and exhibition histories as the Center is often one of an artist’s very first exhibits. The Center is very proud of having been on the cutting edge of a number of modern artistic movements because of its willingness to support new emerging artists and artistic visions, a spirit that remains alive. An article in the San Francisco Chronicle recently asserted that the Richmond Art Center had the 5th best of the top ten exhibits of 2012. The Center’s studio program is one of the best in the area. Students can pursue painting and drawing; metals and jewelry making; weaving and textiles; silk screening; mixed media; and other artistic forms. There are approximately 50 classes/workshops for students of all ages and skill levels. Ric stated that the Center seeks to engage in partnerships throughout the community. Recently they partnered with the Richmond Public Arts Program to beautify the Richmond greenway by creating mosaic benches and bike racks. The Center is now back in schools after a five year hiatus providing after-school activities at several elementary and middle schools, as well as at other organizations that serve children and youth. They also partner with the Lawrence Berkeley National Laboratory; the Lawrence Hall of Science; and the Exploratorium helping youth to build problem-solving, cognitive thinking, and creative collaboration skills. In terms of funding, 40% of the agency’s revenues comes from the City of Richmond, 32% from earned income or fees; 16% from private foundations; 12% from corporations and independent donors; and .02% from a small endowment. The Center’s goal is to conduct an endowment campaign within the next year and to focus on planned giving opportunities. Ultimately, the Richmond Art Center strives to be a place “where one can rekindle the youthful discovery of art making; where lifelong learning is the norm rather than a privilege, and where one finds an emerging environment to expand horizons and have fun”.